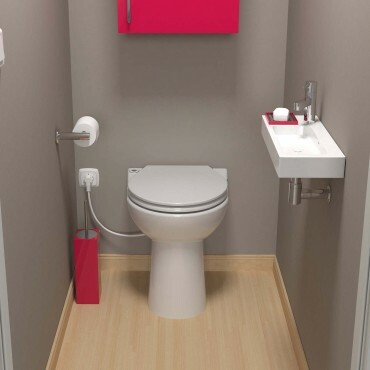 Whatever the project, Saniflo has a solution to overcome those situations where drainage is a problem. A bath in the basement, a loo in the loft or a shower under the stairs with Saniflo the possibilities are endless! To help you with all of our different products find our easy to install instructions here. If you have any issues during installation our technical team are always here to help. If you have any questions or need a spare part, our technical team are here to help, simply fill out our contact form and we will be in touch ASAP or call us to speak to one of the team. The Sanicompact is a toilet with built in macerator. It has slim dimensions and can help create the perfect cloakroom.